Although I never know exactly what to expect when I head out for a row, I always know I’ll encounter something special. On some mornings, I’m struck by a beautiful sunrise, a colorful cloud show or the rising mist over calm water. Other times, the sound of birdsongs fills me with joy. The plaintive call of an Eastern phoebe, the chattery voices of bluebirds or the crass caws of crows sounding the alarm to other birds that a human has invaded their space. As I methodically stroke through clear water, I might catch a glimpse of a soft-shelled turtle swimming by or fish guarding its round sandy nest on the lake bottom. Once I looked over the edge of my boat and saw a young alligator, a surprising find in a lake in which gators are seldom seen. Seeing unexpected wildlife is one of the things I like best about being in my boat in those in-between hours when it’s not quite light yet but neither is it still dark. Some of my most memorable moments during those early morning rows include chancing upon a pair of great horned owls perched in a pine tree near the shoreline, a coyote strutting across a field before disappearing back into the woods and a bobcat sitting calmly by the water’s edge as if it too was enjoying the morning view. From my rowboat, I’ve seen feral hogs nesting in muddy wallows, and bright colored cardinals trying to divert my attention from their own nests in bushy plants. I’ve sighted many belted kingfishers, osprey and the occasional bald eagle. I’ve observed sandhill cranes, common yellowthroats and palm warblers. 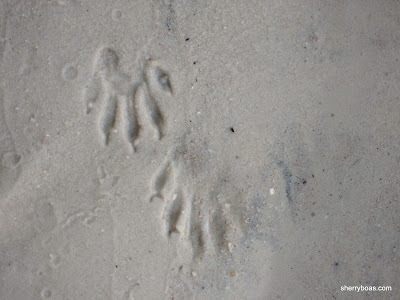 Every now and then I notice a raccoon but more often I see their footprints in the soft sand where my boat is launched. A few days ago, I was taking yet another early morning row through the still water when I chanced upon a great blue heron, the largest heron in North America, with a six-foot wingspan. The heron was hunting in the shallow reed-filled water along the southern shoreline. It was very misty that morning and, although herons frequently visit our lake, I hadn’t seen one for several months and was not particularly anticipating its presence. The long-legged, grayish-blue-feathered bird probably wasn’t anticipating my presence either. I think we both surprised each other when my boat skimmed along through the mist only a few yards away from where it was hunting. Fortunately, the heron stood its ground and I averted my eyes so I wouldn’t startle the bird any more than I already had. I’ve learned over time not to look directly at wildlife. Furtive glances are fine but blatant staring seems to incite nervousness in most wild animals that often leads to lost opportunities of prolonged observation. With that in mind, I moved slowly, picked up my camera and began taking pictures. With my boat no longer in motion and my eyes looking into the camera instead of staring directly at the bird, the heron overcame its anxiety and continued its steady patrol through the shallow water in search of prey. With its long, sharp beak and strong mandibles, a great blue heron is an adept hunter that prey upon frogs, snakes, fish, lizards, moles and small birds. Adaptable to both freshwater and saltwater habitats, it often hunts alone although it tends to gather with others to roost in the evenings. "My, what a long beak you have"
"The better to catch me some fish!" Although I didn’t see the heron catch anything during that morning, I have observed such moments in the past. This time, however, simply seeing an unexpected bird during my morning row was satisfaction enough. Small person in boat meets large bird in water. A fine way to begin yet another amazing day.